FIRE: diesel-fuelled, with integrated burner, heating by radiation. These models are characterised by the absence of moving air: the flame generated by the burner heats the parabola, which, thanks to its high temperature, stops and burns all combustion residues, guaranteeing clean combustion and 100% efficiency. They are used for heating very large spaces (warehouses, industrial sheds, yards, open spaces, etc.) or where suspended dust particles must be avoided. 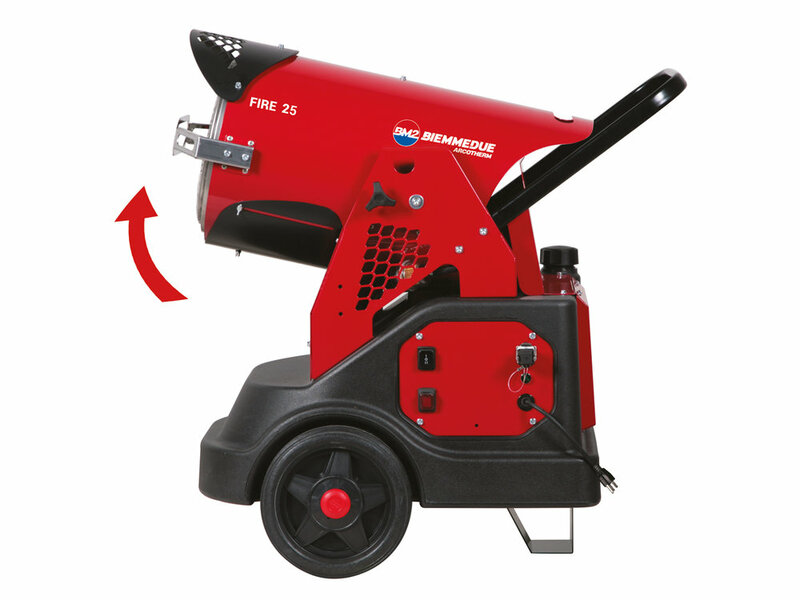 The Biemmedue offer includes two models: FIRE 45 and FIRE 25, with less power, quick and easy to install thanks to its compactness. They are often used in workshops, car washes, laboratories or garages. The clean combustion that takes place thanks to the high temperatures reached by the parabola, makes the FIRE a perfect model for all those cases where air cleaning is a priority.